Nash, 28, is the co-winner of the 2004 Maurice “Rocket” Richard Trophy as the League’s goal-scoring leader, and a two-time 40-goal scorer (2003-04, 2008-09). The first overall pick in the 2002 NHL Entry Draft is a five-time NHL All-Star (2003-04, 2006-07, 2007-08, 2008-09, 2010-11) and a two-time Olympian (2006, 2010) with Canada. He was also awarded the NHL Foundation Player Award following the 2008-09 season, in recognition of his outstanding work in the community. Nash has skated in 674 career regular season contests in nine seasons with Columbus, registering 289 goals and 258 assists for 547 points, along with 568 penalty minutes. He departs Columbus as the franchise’s all-time leader in several statistical categories, including: games played (674), goals (289), assists (258), points (547), power play goals (83), power play points (182), game-winning goals (44), shorthanded goals (14), hat tricks (five), shots on goal (2,278), multi-goal games (46), and multi-point games (136). 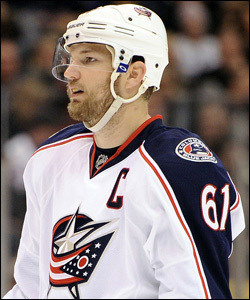 With 289 career goals and 547 career points, Rick Nash, a former No. 1 overall draft pick, leaves Columbus as the franchise's all-time leading scorer. Nash is one of eight players in the NHL all-time to register 40 or more goals as a teenager, and became the youngest goal-scoring leader in League history after tallying a career-high, 41 goals, in 2003-04 at the age of 19 years, 291 days. He established career-highs in assists and points during the 2008-09 season, registering 40 goals and 39 assists for 79 points in 78 games. He also posted career-highs in plus/minus rating (plus-11), shorthanded goals (five) and shorthanded points (six) that season. In addition, Nash has registered three points (one goal, two assists) in four career playoff contests. The Brampton, Ontario native registered 30 goals and 29 assists for 59 points, along with 40 penalty minutes in a career-high, 82 games last season. He led Columbus in goals, points, power play goals (six), power play assists (13), and power play points (19), and ranked second on the Blue Jackets in assists. He also led the team and ranked fourth in the NHL with 306 shots on goal. Nash posted 14 multi-point performances, including five multi-goal efforts, and recorded 12 points (six goals, six assists) in the final 10 games of the season. He notched his 30th goal in the season finale on April 7 vs. the New York Islanders, marking the fifth consecutive season and seventh overall he has reached the 30-goal plateau. Selected with the first overall pick in the 2002 NHL Entry Draft, Nash entered the League immediately as an 18 year old, registering 17 goals and 22 assists for 39 points, along with 78 penalty minutes and 16 power play points in 74 games during the 2002-03 season. He was named to the NHL All-Rookie Team and voted as a Calder Memorial Trophy finalist, as the NHL’s rookie of the year. He also participated in the NHL YoungStars Game during the NHL All-Star Weekend, registering two goals and one assist for the Western Conference team. Nash notched a goal while making his NHL debut on October 10, 2002 vs. Chicago, becoming just the eighth No. 1 overall draft pick to score in his first career game and the first to score in his first game in his draft year since Mario Lemieux in 1984. Internationally, Nash has represented his native Canada in several tournaments. He captured a gold medal at the 2010 Winter Olympic Games in Vancouver, British Columbia, registering two goals and three assists for five points in seven games. In 2007, he was named tournament MVP at the World Championship after recording 11 points (six goals, five assists) and a plus-eight rating in nine games to help Canada win the gold medal. Nash has also captured two silver medals at the World Championships, in 2005 and 2008. He led all tournament skaters in goals (nine) and ranked second in points (15) en route to being named to the All-Tournament Team in 2005. In 2008, he registered 13 points (six goals, seven assists) and a plus-nine rating in nine games, and was named to the All-Tournament Team for the third time. Delisle, 21, split last season between the Springfield Falcons of the American Hockey League (AHL) and the Chicago Express of the ECHL. He made his professional debut with Springfield (AHL) on October 8 at Albany, and skated in six AHL contests. Delisle spent the majority of the season in Chicago (ECHL), where he registered one goal and three assists, along with 20 penalty minutes in 38 games. He made his ECHL debut on November 4 against Cincinnati, and tallied his first ECHL point with an assist on November 9 at Toledo. Delisle recorded three points in a three-game span beginning with an assist on March 24 against Kalamazoo and concluding with his first career multi-point effort on March 28 against Cincinnati (one goal, one assist). His goal in the March 28 contests was Delisle’s first career ECHL goal. Prior to turning professional, Delisle skated in 253 career contests over four seasons with the Gatineau Olympiques and Rouyn-Noranda Huskies of the Quebec Major Junior Hockey League (QMJHL), registering 17 goals and 83 assists for 100 points, along with 300 penalty minutes. He established QMJHL career-highs in assists (25) and points (30) with Gatineau during the 2008-09 season, while setting a career-high in goals (six) the prior season. In addition, Delisle tallied three goals and 16 assists for 19 points, along with 43 penalty minutes in 45 career QMJHL playoff games with Gatineau and Rouyn-Noranda. The Levis, Quebec native was originally selected by Columbus as a fourth round choice, 107th overall, in the 2008 NHL Entry Draft. Anisimov, 24, skated in 79 games with the Rangers last season, registering 16 goals and 20 assists for 36 points, along with 34 penalty minutes. In three seasons with New York, he has recorded 46 goals and 62 assists for 108 points, along with 86 penalty minutes in 244 career regular season contests. The Yaroslavl, Russia native was originally selected by the Rangers as a second round choice, 54th overall, in the 2006 NHL Entry Draft. Dubinsky, 26, skated in 77 games with the Rangers last season, registering 10 goals and 24 assists for 34 points, along with 110 penalty minutes. In five seasons with New York, he has recorded 81 goals and 132 assists for 213 points, along with 457 penalty minutes in 393 career regular season contests. The Anchorage, Alaska native was originally selected by the Rangers as a second round choice, 60th overall, in the 2004 NHL Entry Draft. Erixon, 21, skated in 52 games with the Connecticut Whale of the American Hockey League (AHL) last season, registering three goals and 30 assists for 33 points, along with 42 penalty minutes. He also tallied two assists in 18 games with the Rangers. The Port Chester, New York native was acquired by the Rangers along with a fifth round pick in the 2011 NHL Entry Draft (Shane McColgan) from the Calgary Flames, in exchange for forward Roman Horak and two second round picks in the 2011 NHL Entry Draft (Markus Granlund, Tyler Wotherspoon). He was originally selected by Calgary as a first round choice, 23rd overall, in the 2009 NHL Entry Draft.